My progress on Dress Me Up! has been stalled. The interior of the quilt .. the part that assembled all the embroidered dress blocks with the sashing ... has been completed for a while. I had picked out an outer border from Electric Quilt's library but I really wasn't thrilled with it. Honestly, I wasn't feeling the love. So, I just let the sewn-together dress blocks hang for a while, as I cogitated on the situation. Unfortunately, the Light Bulb Moment wasn't happening. Eventually, I took the bull by the horns, pulled out all of my resource books on borders (which numbered about 5 or 6) and started *really* looking through them. Surely, there would be SOMETHING there that would work nicely with the dress blocks! 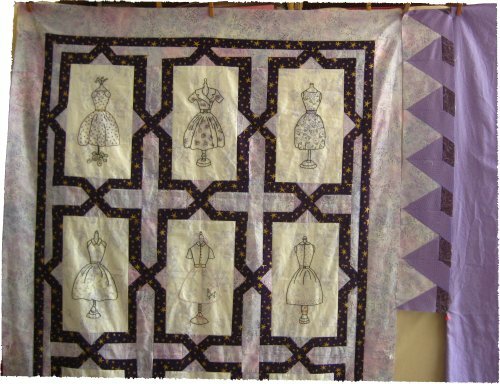 To refresh your memory, the original pattern calls for this quilt to be finished as just the dress blocks being sewn together. This results in a small quilt .. a personal sized throw ... or a good sized wall-hanging. Well, I really do prefer to make bed-sized quilts, so I wanted to add some interesting border(s) to the dress blocks to make it at least a twin sized quilt. Hence, my need for a very wide border. Specifically, about 12" of outer borders! And, doggone it! Didn't I just find something that I liked and would work out nicely! The border is "Woven Dogtooth" from the book "Foundation Borders" by Jane Hall and Dixie Haywood. [That link is for the book listed on Amazon, but if you do a Google search, you'll find many other sites offering the book also.] This is one of my very favorite books for pieced borders; I've used several from this book and I've never been disappointed. I used Electric Quilt to help with the design process and, in the case of this border specifically, it was invaluable. To help provide a visual space between the embroidered blocks and the woven dogtooth blocks, I had a 3" plain border. The measurements of the resultant sides, top & bottom were oddball; of course they were. They certainly wouldn't have been anything tidy, you know??? I needed to have the woven dogtooth blocks fit the length of this 3" plain border *exactly*. Electric Quilt let me audition various number of blocks along the sides and it seemed to me that 14 woven dogtooth blocks along each side looked to be a nice arrangement. There wasn't anything sacrosanct about 14 blocks ... they just looked nice. If I had put more blocks in the border, the triangles would have been skinnier; if I had used fewer blocks, the triangles would have been wider ... so 14 seemed to be the appropriate number. Unfortunately, dividing the length of the side by 14 yielded an entirely obnoxious number ... those woven dogtooth blocks needed to be 5.285" wide. Good grief!!! Who can figure out a block with *that* unreasonable width??? Well, Electric Quilt can! All I needed to do was have Electric Quilt print out the woven dogtooth block at 5.285" wide by 5" long ... and voila! .. there was my template for paper piecing! Ah yes ... I had decided that paper piecing would be the easiest way to faithfully reproduce that block *accurately* every time. Furthermore, standard paper piecing makes you stitch through the paper template and then remove the perforated paper after stitching .... a step that I just HATE HATE HATE! ... I view it as a waste of time and a huge mess! However, I have learned an alternative method ... Freezer Paper Piecing. This method creates a template that is rather like a Post-It note, because you do NOT stitch through the freezer paper, which means you can remove the template *intact* and *reuse* it for as long as the freezer paper remains "sticky". The link above will take you to my tutorial on this handy technique. Off I went, making my 14 woven dogtooth blocks, desperately hoping that when I sewed all of them together, they WOULD, in fact, match the length of the 3" plain border. If not, I was going to need to fudge some of them. Holding my breath, I stitched the blocks together, pressed the seams open and spritzed the entire column with Magic Sizing to provide some body. You do realize that you pay JUST AS MUCH (as in yardage) for your scraps as for the yardage they came from? Kinda puts a new perspective on all the scraps you generate as you are creating your main project, doesn't it? At the side of my sewing machine, I have 3 receptacles. The main box is for "scraps" ... almost anything that is even vaguely useful for future use, whatever that use might be. I just toss the scrap into the box. At a later date, when the box is overflowing :-) , I will sort all the different fabrics. Small pieces, i.e. "crumbs", are something that I would have normally thrown away. BUT, my quilting buddy, Sharon, creates "fabric" from crumbs by sewing them all together willy-nilly. As long as there's a seam allowance with some fabric left over, she'll use it! So, now, I save all those much smaller pieces as "Crumbs for Sharon"! 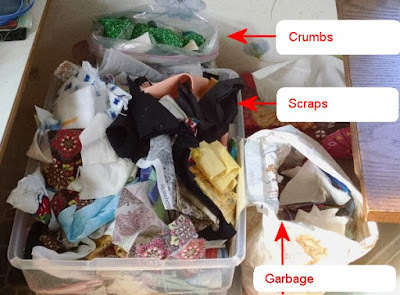 The crumb bag is behind the scrap box. The last receptacle is the garbage/trash bag. That's for everything else. 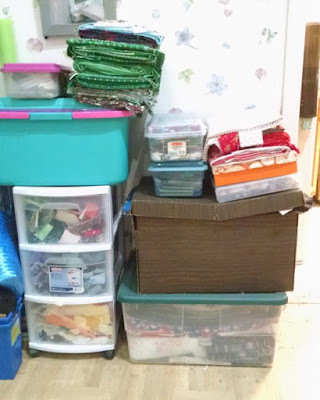 So, when the scrap box is completely overflowing and threatens to over take my sewing room, I sort through everything. The first pass is strictly by the main color. I'll confess that I do have problems when it's a multi-color print or stripe .. what IS the main color? Sometimes I don't have an answer. Once I have my color piles, I dumped them into a Sterlite, 3-drawer small tower. 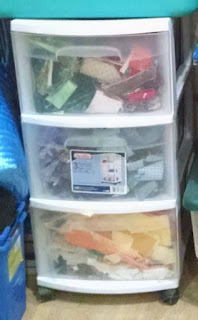 Now, I do have more than 3 color families of scraps, but the 3-drawer tower is what I had. (I try to use what I have on hand first, just to minimize the cost.) So, I put 2 colors into each drawer. This worked for a while, but as I continued to work on new projects, generate more scraps and sort the scraps into their color families, these poor little drawers rapidly became overcrowded. It got to the point where I really couldn't stuff anything else into those drawers and even opening them was difficult. At this point, it really was time for a new system. As I usually do when pondering a new solution, I think about what is NOT working with the current setup and what (ideally) I'd like the new system to be like. For scraps, I'd truly like to have one drawer/cubby/box for each color family and obviously bigger than the drawers I currently have. 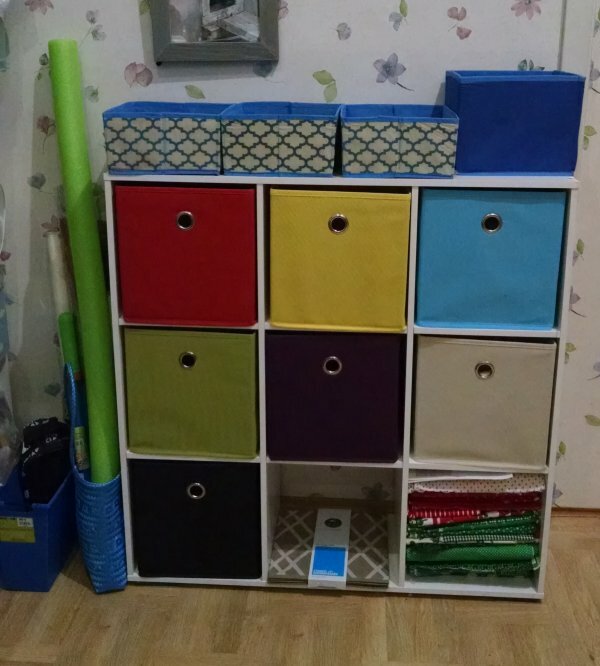 I remembered seeing a shelf/cubby unit that had 6 spaces (to put fabric drawers in or to leave empty), which would work ideally for my scrap fabric storage system. Target had such a unit; it's knock-down so you need to assemble it at home. And the manufacturer also had lots of fabric cubbies to coordinate with the shelving unit. Back on the home front, I assembled the shelving unit (about 45-60 minutes .. very easy), put all the cubbies into the spaces and promptly filled them with appropriate colored scraps. WOWSERS! It looks so clean and tidy! So ... here is my "Before" picture: the scrap tower is on the lower left. Stacked on top of the tower is a pile of green fabric that was given to me and a blue tote of needlework supplies. To the right side are two BIG boxes of more donation fabric and more needlework supplies. The needlework supplies don't really belong in my *sewing* room, but the room where I've been (temporarily ... for a few years) storing my needlework supplies really doesn't have any extra space either. So, there these items have been sitting for a while. But, circumstances have changed; that room now *does* have space in it, so off the needlework supplies have gone to their new home. The two big boxes of donation fabric have been shuffled off to another room. I'm not thrilled to do that because I tend to be "out of sight/out of mind" but until I get some of my UFOs finished, I won't have the space in my sewing room to house those two boxes. That left this entire wall space available for my new fabric scrap storage unit! I have fabric boxes for red/pink, yellow/orange, blue, green, purple, tan/brown/ecru, black/gray/white. That left 2 spaces leftover, so I put the green & red donation fabric in one space ... just so I wouldn't forget about them. I do have an immediate project planned for them and wanted them to be staring me in the face as a "nag". The one remaining space is still emtpy. I have a fabric cubby for it but haven't opened it up yet, as I'm not entirely certain that I want to keep it. Nor have I decided what I want to put into that space. I briefly considered just stacking the two boxes of donation fabric on top of the shelving unit, precisely so they would remain in the sewing room, but as you know, fabric is HEAVY. This self-assembled, knock-down unit is not a piece of fine furniture (cough, cough) and while it is perfectly suitable for the purpose that I need it, I'm NOT entirely certain that it would hold up the two *heavy* boxes of fabric.